In the previous post, we introduced Candy Kid: a simple maze chase video game written by Grandstand Leisure from New Zealand in September 1984 using BASIC programming language on the Sega SC-3000. 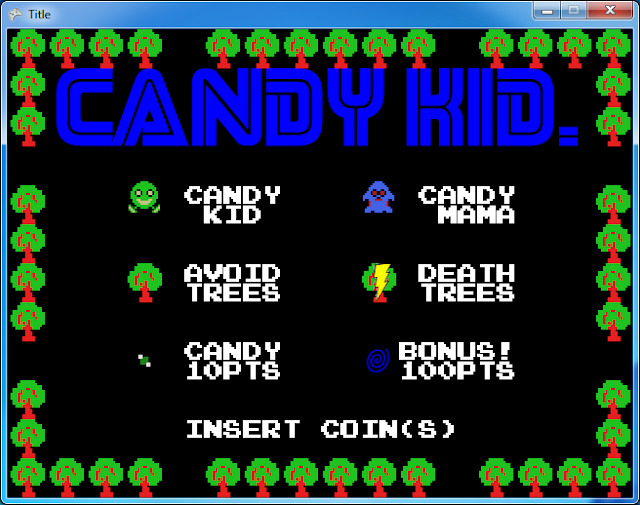 Recently, Candy Kid was re-written in XNA using C#/.NET. However, in order to keep the super cool 80s retro arcade video game look and feel, all original programmer art in Candy Kid was used for the sprites. Let's check it out! Note: in order to follow the code along first ensure you have your PC setup for Sega BASIC programming. 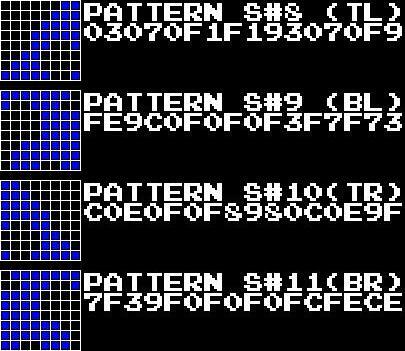 All code listed inspired from Sega Computer magazine Sprites tutorial, also published in September 1984. Think of a sprite as piece of transparent film over your television screen. Each individual sprite is made up of group of 64 dots (8 by 8 pixel block). Each dot may be turned "on" (made visible) or "off" (not visible). 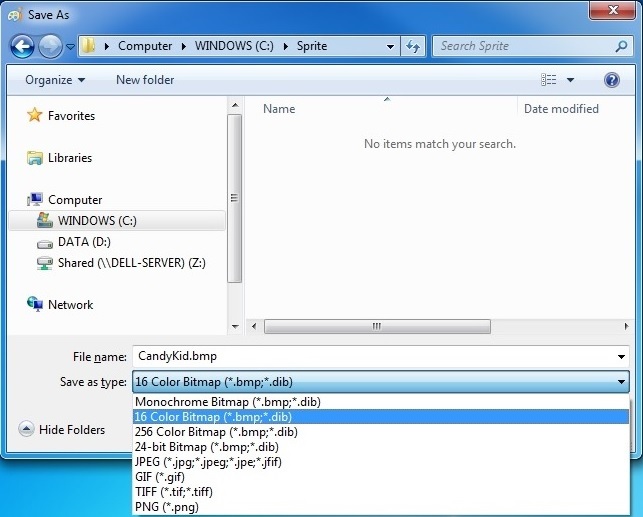 To instruct the computer what 64 sprite dots look like, use binary notation to define each pixel as either turned "on" (value=1) or "off" (value=0). 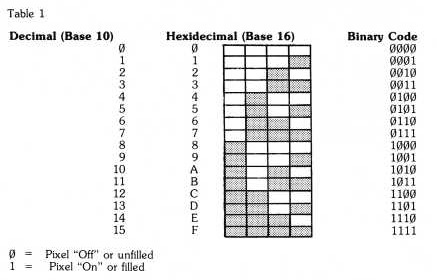 Hexadecimal notation is then used to group 4x pixels at a time. Press the "End" key to break. All sprites in Candy Kid use Mag 1. 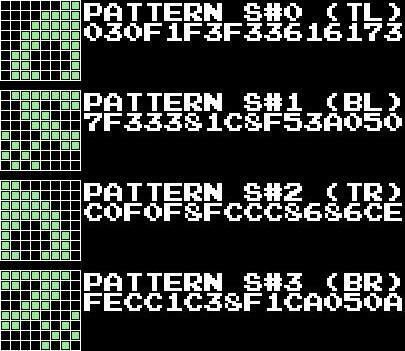 Therefore, four patterns are used to generate each 16x16 pixel sprite. Note: original source code used MAG1 because the screen resolution on the Sega SC-3000 was 256x192. 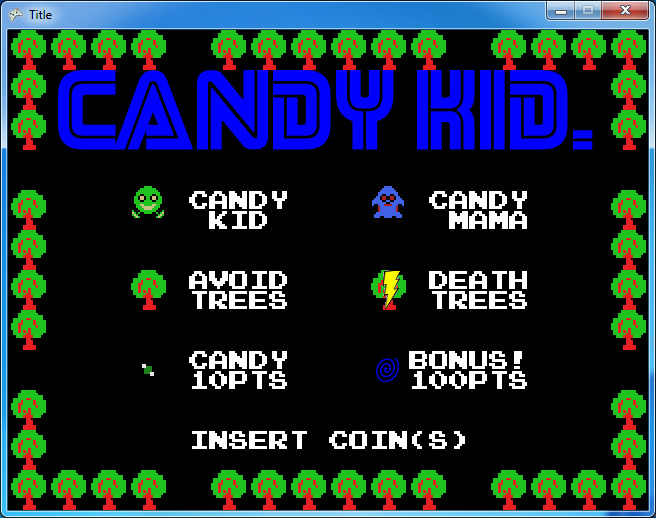 However, as Candy Kid is being re-written for higher screen resolution, e.g. 800x480, use MAG3 instead! After running the code (above), take screen shot i.e. press Print Screen button and save the BMP image. Download, install and launch Paint.NET. Open the original 32x32 Candy Kid BMP image saved and processed above. Choose Magic Wand. Click black image background. Press delete. This makes background transparent. Save new image as PNG file to include transparency. That concludes how the programmer art was created for the original title on Sega SC-3000 in BASIC and how the art has been re-used for an updated version; which has been re-written in XNA using C#/.NET. However, ultimate goal would be to re-write Candy Kid in C / Z80 assembler for the Sega Master System! The z88dk Programming Sample demonstrates how to convert the original 16x16 pixel sprites to a format the Sega Master System (SMS) understands. This includes the Palette, Tiles, Tilemap and the Sprite table. Download and launch BMP2Tile. 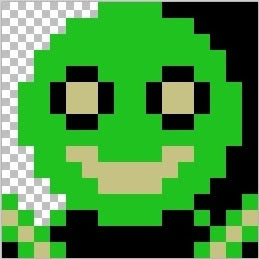 Drag n' drop 16x16 pixel source sprite onto open "Source" tab. 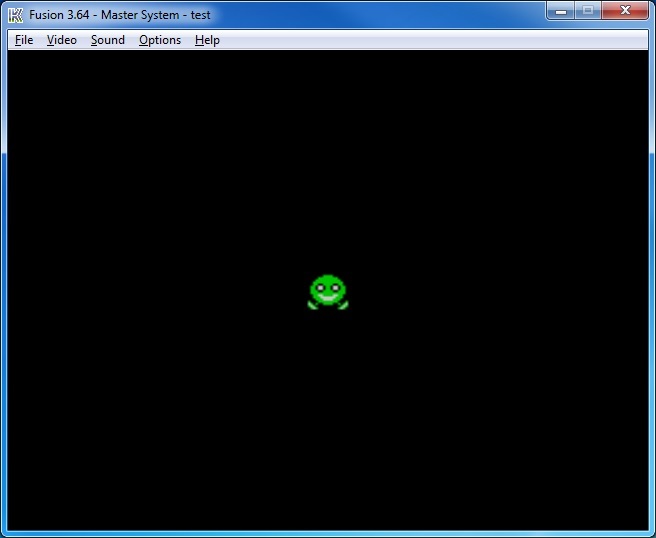 Finally, write small program similar to the Target Sprite program in z88dk Programming Sample to test. First, create new directory: C:\CandyKid. Next, add the following 3x files here: test.s, linkfile and test.c. .SDSCTAG 1.0, "Candy Kid", "Candy Kid sprite test", "StevePro Studios"
If you have C:\PerfomBuild.bat setup as per previous post then simply hit Ctrl+1 hot key to run the test. 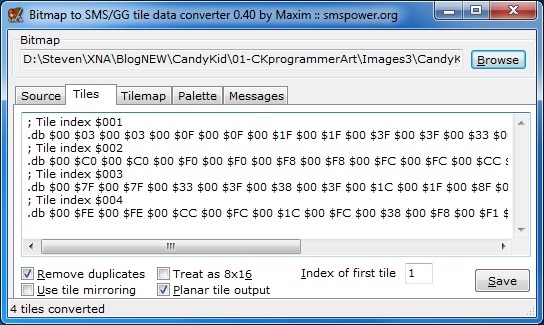 Outstanding: add remaining Candy Kid sprite graphics to program in order to complete SMS game code!